Welcome to our roof restoration fund homepage – check back here regularly for news, updates and information on our project to raise £226,000 to restore the church roof. 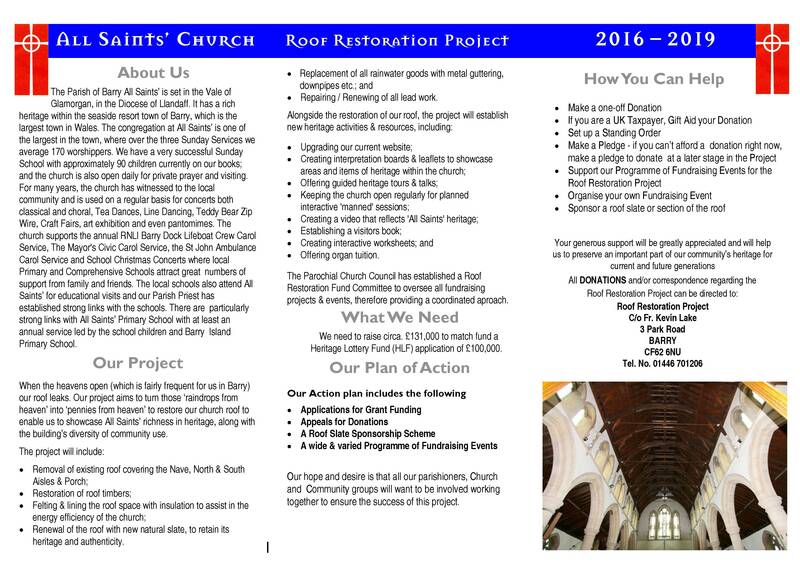 You can download the roof restoration project leaflet by clicking here, or have a read below. Here you can find all the information you need about what we’re planning, how to get in touch or the many ways you can donate. We were successful in obtaining a grant from the Heritage Lottery Fund of £100,000 as well as close to £40,000 from other charitable trusts and foundations. We’ll be updating this page regularly to let you know how the fundraising is going, and the different ways you can get involved to support this project. 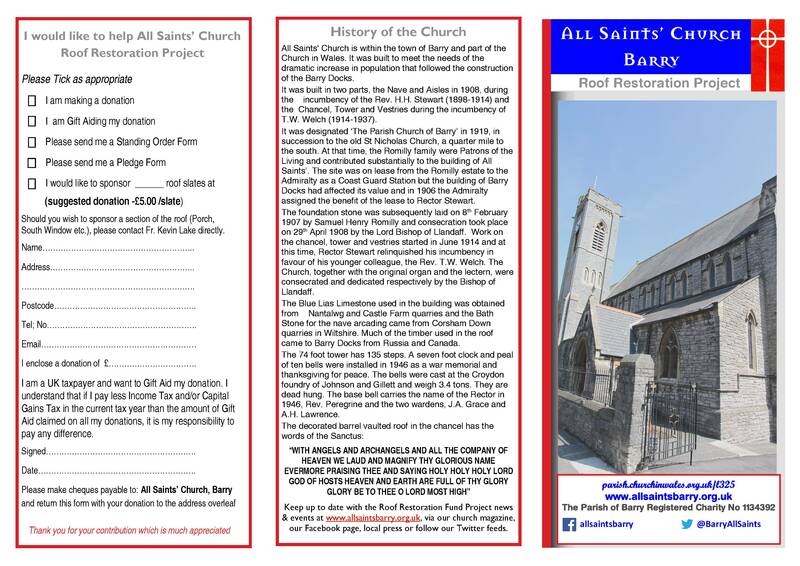 Thanks to the Heritage Lottery Fund a new roof has been made possible and enabled All Saints’ Church, Barry to continue to serve its community for at least the next century! The £104,400 grant received was an important investment that will help protect the physical assets for future generations whilst preserving and engaging with the community. The total cost of the roof restoration project was £226,289. Richard Bellamy, Head of HLF in Wales, said: Wales’ historic and diverse places of worship are so often at the heart of our communities. Thanks to National Lottery players we can fund both urgent structural repairs and improved facilities. All Saint’s Church is an excellent example of how HLF can help conserve a much loved building so it can continue to serve its local community. During the last 18 months the roof restoration committee and members of the congregation have worked extremely hard raising over £58,000 towards the remaining funding required. This commenced with a ‘Sponsor a Slate’ scheme that raised over £10,250 in the first four months. In addition over 40 fundraising events/activities have taken place from Autumn Lunches, Recitals, Beetle Drives, Concerts to name but a few. Paul Donovan stated “the way the project has galvanised support and success has been incredible! Although we have the community element of the project to complete during the next 6-9 months at least we can do this in the warm and dry and know that the hardest part of the project has been completed”. Trust, James Pantyfedwen Foundation and Barry Town Council. Fr Kevin Lake and Chairman Paul Donovan would like to express their grateful thanks to the Heritage Lottery Fund and all those involved in making the new roof possible. Placemats and Coasters – These unique handcrafted reclaimed 1908 Welsh slates which have been made into placemats and coasters will also be on sale from 9th September 2018. 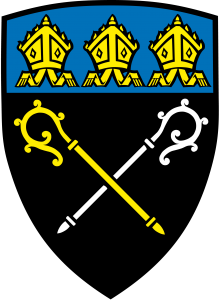 Tickets for Joy Hume’s “Billy, Jack and the Beanstalk” will be going on sale at the beginning of September 2018 – from usual committee members and benefice contacts in our other churches. The show will commence at 7.00 pm; and tickets are priced at £10 for adults, £5.00 for children which will include tea/ coffee and cake. Anne Brock and David Hop have agreed once again to co-ordinate the Christmas Fayre in support of the roof project. If you wish to reserve a table please contact either Anne or David asap. We will also be inviting external stall holders as last year. Additional information will be available in the September and October magazines. The ‘Soup Ladies’ have offered to provide the Autumn Lunches once again this year. Lunch includes soup and crumble and the usual raffle. Tickets are priced at £5.00. More information in the October magazine.